Dr. Trimillos is Professor was Ethnomusicology at the Music Department and Chair of Asian Studies at the School of Pacific & Asian Studies, University of Hawai’i at Mānoa in Honolulu, Hawai`i. His purview is broadly based and includes the expressive arts (music, dance, theatre) in their social environment. He has been consultant to a number of governments (including the former Soviet Union, Malaysia, the Philippines, and Hong Kong) in the area of arts and public policy. He lectures regularly at German universities. His research foci include Asian peformance, Hawaiian music and dance, and the music of Muslim groups in the Southern Philippines. His theoretical emphases include ethnic identity, the arts and public policy, and issues of gender in the arts of the Pacific and Asia. He is a recognised resource for world music in public education. His publications-in three languages-include articles on Asian-Americans, world music in higher education, cross-cultural implications for the arts, interrelationships of the arts, Philippine ritual, and Hawaiian music. He is a scholar and a performer. His principal medium is the Japanese koto, with attention to avant garde works for the instrument. In February 1985 he premiered a concerto for koto with the Reading Symphony written by Honolulu composer Neil McKay. He performs regularly on the U.S. mainland; he has presented concerts of modern and traditional music in Europe, Japan, the Philippines and Australia. 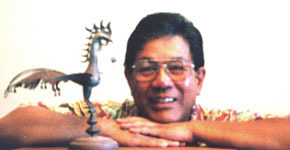 In 1989 he was musical director for a Filipino sarsuwela (operetta), in 1995 for the Japanese kabuki play Sukeroku and in 1999 for Natsu Matsuri, productions at the University of Hawai’i. In 1994 he was Visiting Professor at UCLA as consultant to establish the new World Arts & Cultures Department. He also created a course on Asian-American expressive arts for Asian-American Studies there. He sits on the Editorial Board of Amerasia Journal. He has served as scholarly consultant to the Brooklyn Academy of Music and the Asia Society for projects concerning Asian and Asian-American performance. He is a past commissioner for the State Foundation on Culture & the Arts (Hawai`i) a national panelist for the NEA Heritage programs, and advisory board member for the Smithsonian Institution Folklife Center. His undergraduate degree is from San José State University in music and English literature. The M.A. in music-ethnomusicology was completed at the University of Hawai`i sponsored by the East-West Center. He completed the Ph.D. at the University of California, Los Angeles in 1972. Other institutions for advanced study include the Ateneo de Manila, Philippines and the University of Cologne, Germany. 2008 “Histories, Resistances, and Reconciliations in a Decolonizable Space: The Philippine Delegation to the 1998 Smithsonian Folklife Festival.” Journal of American Folklore 121:479:60-79. 2004 “Subject, Object and the Ethnomusicology Ensemble: the Ethnomusicological ‘We and Them. '” Performing Ethnomusicology: Teaching and Representation in World Music Ensembles edited by Ted Solis. Berkeley: University of California Press. Taking Risks in Safe Spaces; Playing Safe in Risky Spaces. Narrative/Performance: Cross-Cultural Encounters at APPEX, edited by Judy Mitoma, Ricardo D. Trimillos, Anoosh Jorjorian. Los Angeles: Center for International Performance, UCLA. p.12 – 21. 2000 “Ang Dalagang Pilipina; representation and presentation of the Filipino female in traditional musics.” Feasts and Feats; Festschrift for Doreen G, Fernandez, edited by Jonathan Chua. Quezon City (Philippines): Ateneo de Manila University, 2000. p.253-267. “Musical migrations; Hawai’i.” Garland Encyclopedia, Australia and the Pacific Islands pp. 95-101. 1998 “Filipino-American Youth; performing Filipinicity.” 1998 Smithsonian Folklife Festival. Washington DC: Smithsonian Institution. 1995 “More than art: the politics of performance in international cultural exchange.” Looking out: perspectives on dance and criticism in a multicultural world, edited by David Gere. New York: Schirmer, 1995. pp. 23-39. 1992 “Pasyon: Lenten observance of the Philippines as Southeast Asian Theater.” Essays on Southeast Asian Performing Arts: Local manifestations and cross-cultural implications, edited by K. Foley. Occasional papers series no. 18, Center for Southeast Asia Studies. Berkeley: University of California. pp. 5- 22. 1988 “Das filipinische Rondalla-Ensemble auf den Philippinen als Spiegel oder Bestandteil der Filipino-Geschichte.” Jahrbuch für musikalische Volks-und Völkerkunde 13:59-71.